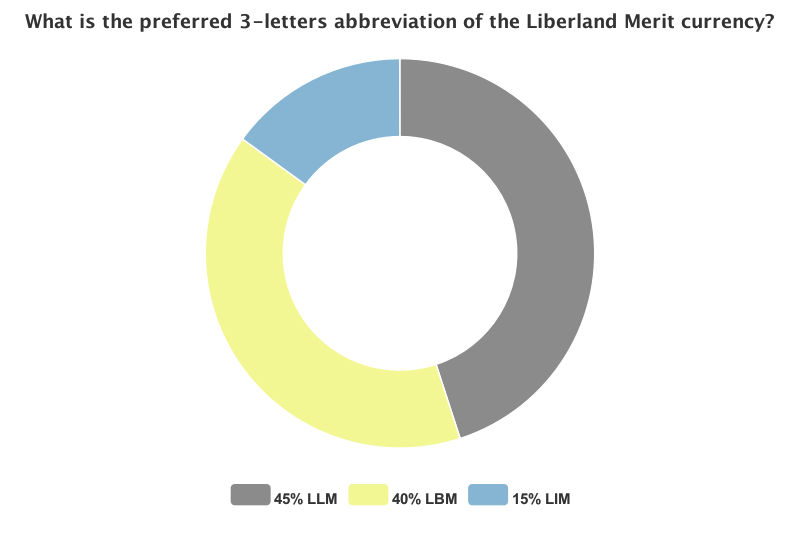 Liberland Merits’ new codename is now “LLM”, as chosen after an open Facebook vote on the 26th of April. From three possible options, LLM won with 45% of votes, outrunning LBM with 40% and the abandoned LIM with the remaining 15%. Liberland’s officials proposed the initial selection, but it was some 3 tho. global supporters who choose LLM in an autonomous vote. This is yet another open event where we encouraged our community to collaborate in forming the country from the grounds up. We thank you all for even the slightest help in all of this. This vote is a small leap ahead for adapting Merits digitally and in print as Liberland’s official currency. The end goal here is to empower people to share them as unregulated value in the same way Bitcoins are used. Right now, Merits serve as compensation to Liberland’s contributors, and already there is an ongoing IT project for a open-source peer2peer Merit marketplace. “In the following years, there will be a universal sharing economy mobile application allowing anyone to provide his/her services to anyone without government control and enforced taxation. It will be an entirely decentralized solution using anonymous crypto-currencies that will be impossible to shut down by the government (like Bitcoin)”. The plan for the full introduction of Merits has two main directions. Citizens will earn Merits by giving service to others and the State, to later roll them in p2p trade as individuals or companies. That boundless, free-market economy should then meet growth of products strictly in demand. The open competition in the market will then nurtures an increase in quality over time. This economic vision is one of the founding principles behind Liberland. People will also use Merits, or a similar functional system, to vote on the country’s evolution, by either proposing their own changes, or by voting on pending State legislation. People will share the power of production and State contribution based on Liberland’s constitutional law. Our scientific minds are going the extra mile for Merits, but the currency still needs to mature. Just recently, Liberland has formed a partnership with Bitnation, a group developing open-source governance systems build on blockchain technology and its atoms – crypto currencies such as Bitcoins and Merits. That partnership might bring a promising exchange of resources and knowledge in the name of greater personal freedom for all. Although the idea of using Blockchain to run a modern country is still shaky, people begin to discover its capabilities for the digitalized society. Both Bitnation and Ethereum and pushing for tests in direct democracy based on crypto currencies, and Russia’s NDS (central finance securities depository) and NASDAQ in Estonia have already experimented with Blockchain technology. For now, the future for Merit can only be judged by where Bitcoin is. Much time passed since its launch in 2009, but it’s still standing, no control, with a daily market volume of $85 mln. And even though it’s decentralized, a full ring of names accept Bitcoin payments on the regular, with Amazon, Virgin Galactic, Zynga, and eBay among many. With your help in building Liberland, Merits could function the same way.